In some circumstances, it may be necessary to access the relay server using a URL such as - "http://myserver.domain.com/".To make it more easy to access your Relay Server website, adding a redirect to the url - "http://myserver.domain.com/Relay/" will be necessary to allow easy access to the website features. 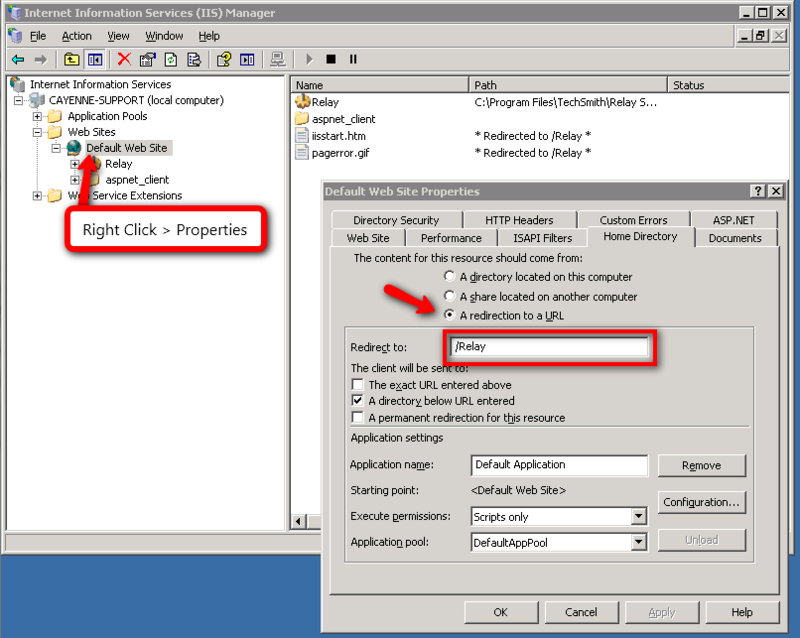 To configure IIS so that accessing http://myserver.domain.com redirects to http://myserver.domain.com/Relay, you will need to access the IIS Manager on the server. This can be accomplished by accessing Start > Administrative Tools > Internet Infomation Services (IIS) Manager > and Right Click on Default Web Site > Properties > Home Directory tab > and select the option of “A redirection to a URL”. In the “Redirect to:” text field, enter “/Relay”. Also, check the option of “A Directory Below URL entered”.